Arpit has a magic in his hands.. awesome work and very cooperative.. he is now our all time fav henna artist and no matter wherever the function/ ceremony we hv , he is always thr to spread his magic... ???????? He's an amazing artist... his henna designs are no less than painting... best mehendi artist in delhi so far. Been really lucky to have roped him in for my wedding. Absolutely in aww with your work. Hope to get more occasions to rope you in Arpit. You are too good. Ps. he's got an amazing, witty, and equally artistic team. Arpit and his team do brilliant work...they were simple amazing and IÃ¢ÂÂm still in awe of the beautiful work they did on my mehendi. Not just me, but my guests were also highly impressed and happy with their art work. I think calling him for my mehendi was one of my best decisions..!! Thankyou sooo much !!! I recommended for my friend and wen I come to know that The color of mehendi was not dark, quite normal kind of service. Not worth of money. Plz try to improve your service if you are charging so high. ???? disappointed. Nice hand on art with awsome finishing, too much perfectness. I hardly recommend him to everone. His work will worth your money. Get best quote from Mehendi by Arpit and book your date! Check their prices and availability. Send enquiry to your selected list of Bridal Mehendi at WedMeGood and choose the best. 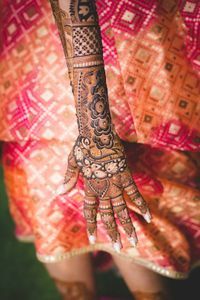 Browse for more Bridal Mehendi in Delhi NCR and more wedding vendors at WedMeGood and plan your wedding hassle free.